As decribed below, Friends of Troopers Hill (working with Bristol Parks) have carried out or facilitated a lot of works on the Field over the last few years. However, there is always more to be done. Following discussions at our meetings, we are are seeking funding for a new path around the Field to the entrance to the Hill itself and also to improve the access track. This will be part of our 'Ways to Nature' project - more details of the project and a consultation on our proposals are available via the link below. We often get requests for memorial trees and benches to be placed on the Field. In 2017 working with Bristol Parks, we found space for an extra tree and an additional bench - located so that it will be at the side of the new path when it gets constructed. Read more about the memorial bench here (pdf). Following the tree planting in 2016 and in 2011 there is now little scope for further trees and we also feel that the Field has enough benches, but please do contact us to let us know what you think. We do though occasionally lose trees; in 2017 a Norway maple was blown over and one of the ash trees planted in 2011 died due to the bark being damaged. Trees that are lost can be replaced through the Council's Tree Sponsorship scheme. The Ash tree that died has now been replaced by a sponsored Scots pine. Due to the risk of ash dieback new ash trees are not currently being planted, so it was necessary to select a different species, this also increases the variety of species of trees on the Field. Sadly, Bristol Parks decided in May 2017 that the remaining logs on the climbing structure installed in 2009 had to be removed. They were initially cut down to a low level and then rest of the structure was removed. The area has now been topsoiled. We are surprised that the logs lasted as long as they did. If you have any ideas as to what should replace them please let us know - perhaps the area should just be left grassed over? Working with Bristol City Council we led a project to construct a new play area on Troopers Hill Field. 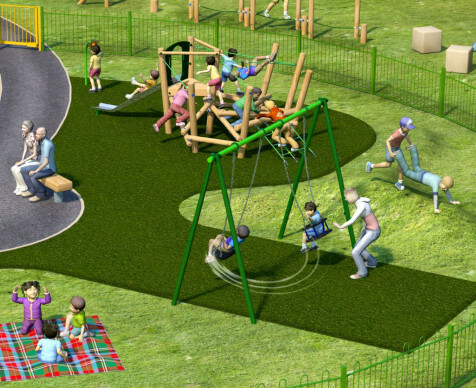 Having been successful in raising funding for the project; we selected Wicksteed Playgrounds to carry out the construction. Funding was from Suez Communities Trust for the �50,000 fenced under 5s play area and access path and Veolia Environmental Trust for the �25,000 activity trail for slightly older children. Taken together and including some additional costs that were covered by the the money allocated by the Neighbourhood Partnership this meant an investment of over �80,000. 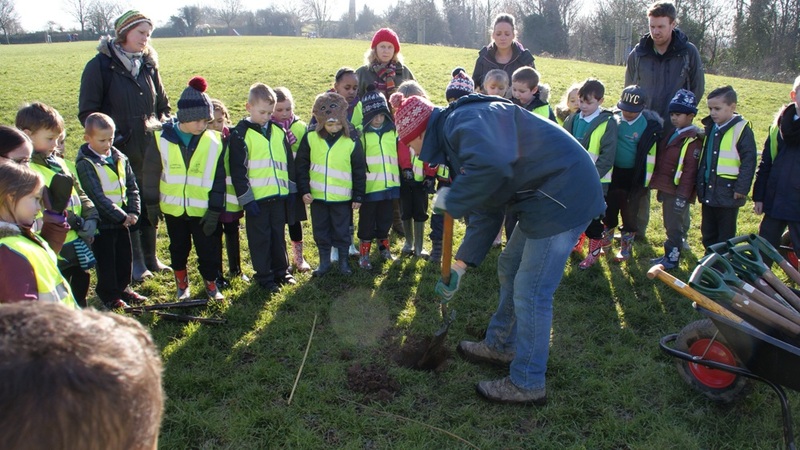 Seven extra trees were planted in Troopers Hill Field at a tree planting event organised by One Tree per Child Bristol on Tues 16th February 2016. There are six wild cherry trees to infill the wide gaps between the existing ones and a hornbeam tree to complete the double avenue of trees along the east side of the field. Pupils from Air Balloon Hill Primary School helped with the planting. There was an opportunity for local people to sponsor these trees so that larger trees (of the same species) would be planted instead, two trees were sponsored under this scheme. Friends of Troopers Hill were especially pleased that one of these was planted in memory of Pete Harris - a great friend of Troopers Hill. The proposal to plant extra trees was reported in our Autumn 2015 Newsletter and Friends of Troopers Hill agreed to support this idea at our meeting on 10th September. Bristol City Council then carried out a consultation on the plan which closed on 16th October, as there were no objections it was agreed that the planting would proceed in accordance with the draft plan. Brunel House, St Georges Road, Bristol, BS1 5UY. One of the most requested improvements for the Field has been for a surfaced path to be installed to link Malvern Rd to Summerhill Terrace (marked in blue on the map above). We are pleased to say that this has now been completed. When the new trees were planted in 2011 space was left between the cherry trees and the hedge to allow for a path to be constructed. Then (following a suggestion at the Friends of Troopers Hill meeting in October 2012) a request was made to the St George Environment Sub-Group for Section 106 money to be allocated to this path; the Sub-Group supported the idea. As reported on the St George Neighbourhood Partnership website here, the allocation of funds was approved at the Neighbourhood Partnership meeting on 11 December 2012. Friends of Troopers Hill were delighted that the Sub-Group and our local Councillors agreed to support this project. The work on the path started on 14th February 2013 tarmac was laid on Mon 25th March and the bench added on 3rd April. The work was managed by the Council's Landscapes Team. In 2012 work was carried out on The Field as part of our Stepping Forward Project. The project included the installation of a new Interpretation Board near the Summerhill Terrace entrance and a seat at the top of the steps leading down into the wood below one of the red benches. A seat in this location was requested by a wheelchair user who wanted somewhere for her daughter to sit while she admired the view through the trees. There is also a new sign with information for disabled people about access to the hill fixed to the fence at the end of Malvern Rd. We have also installed some land-drains to dry out the area near the slide which becomes very muddy in wet weather. This work has been carried out by Classic Landscapes Ltd who also did the work to the steps on the hill itself. In the corner of the Field is one of the waymarkers for the new Woodland Trail. You can read more about the Stepping Forward Project via the link below. On a wonderful sunny winter's day TreeBristol organised a tree planting day on Troopers Hill Field. Friends of Troopers Hill were there to help along with a team from Sky Blue, but most of the work was done by children from three local schools - Summerhill, Air Balloon and Two Mile Hill. As well as the trees, we also planted more daffodils on the bank sloping down to the woodland. Click on the links below for more photographs. The planting layout can be seen below. 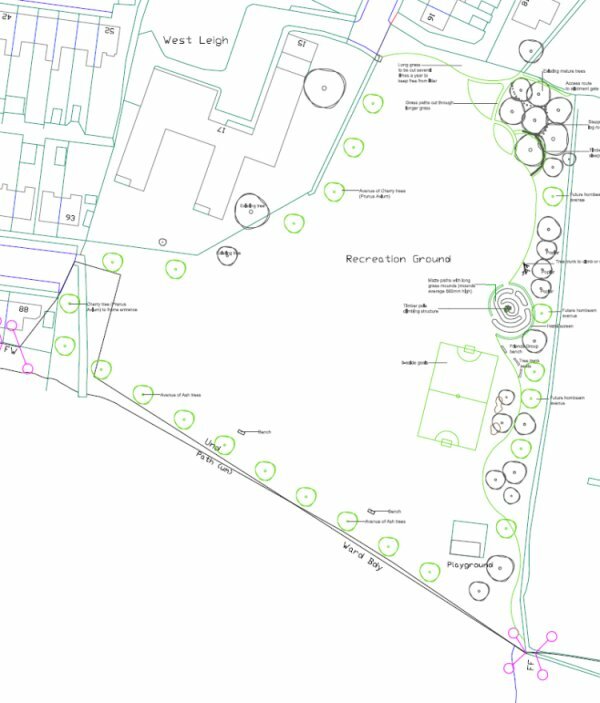 The hornbeams are in locations that trees were proposed in the plans produced for the play area in 2009. The ash trees were selected because their relatively light canopy will not hinder views. The cherry trees should produce a good display of spring blossom once they are more mature, they were planted 5m from the hedge to allow a path to be installed in the future (done in Feb 2013). Three of the trees are 'memorial' trees and members of the families who sponsored the trees were also there on the day. 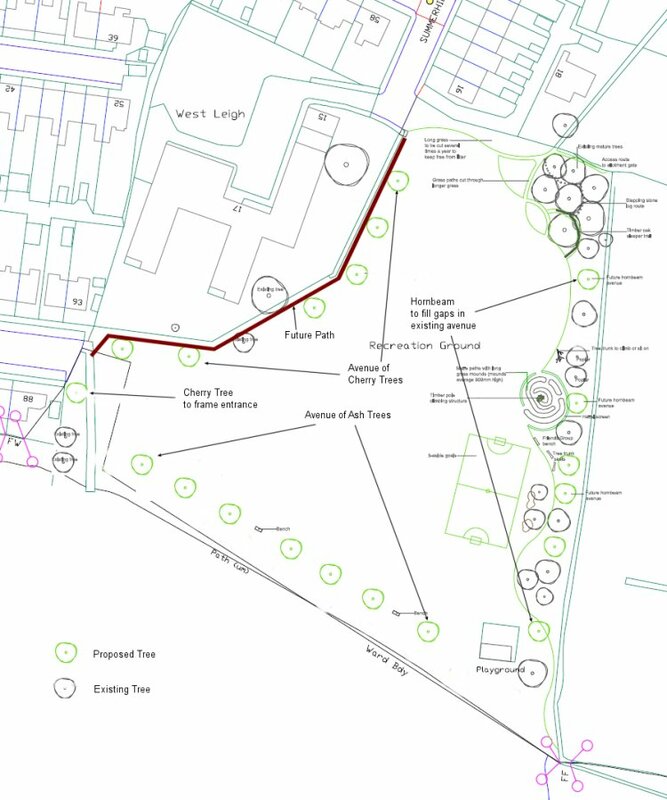 The original plan produced by TreeBristol was revised (following comments at our AGM) to leave gaps in the row of ash trees at the bench locations and maintain the view line (this revised plan was included in our Newsletter). The plan was then tweaked further (as below) to move the cherry tree at the entrance further from the houses in response to further comments. Most of the trees are 'standards' six or seven years old. Six of the hornbeam are smaller 'whips' but still protected by a steel cage. TreeBristol will monitor these to see how their growth over the years compares to the larger trees. 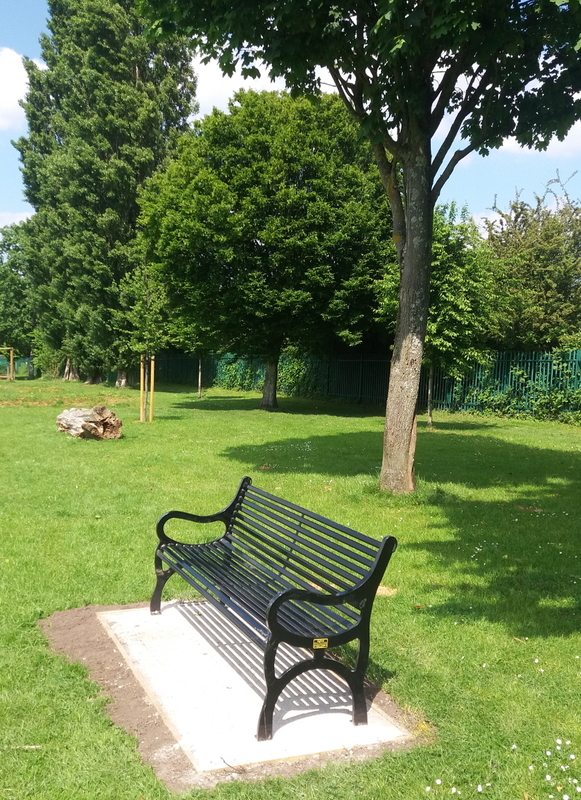 This project was carried out as part of TreeBristol's aim to plant 10,000 trees across Bristol�s parks, open spaces, public housing areas, highway verges and streets. Bristol City Council's aim is to achieve a 30% citywide tree canopy cover, up from the current c.13%. 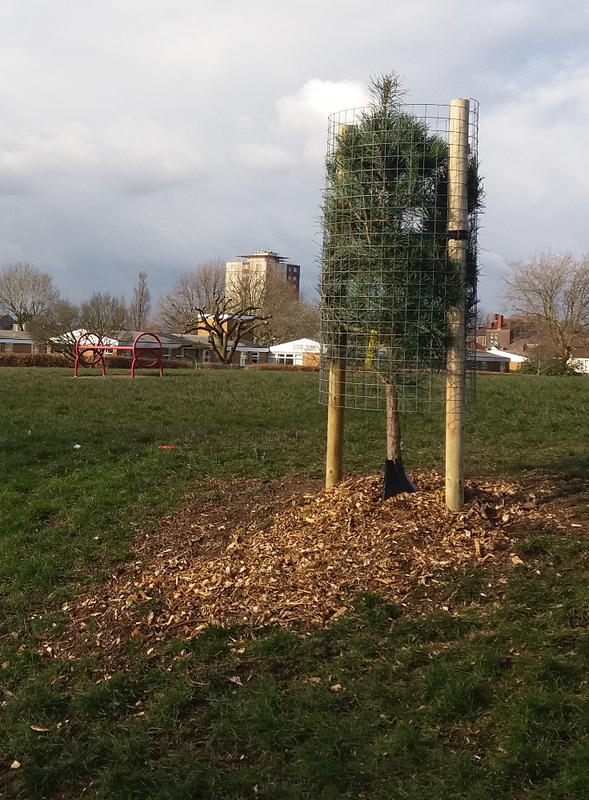 Since this planting scheme was carried out TreeBristol have planted two more memorial trees in Troopers Hill Field to replace two trees lost to strong winds, two of the smaller whips that did not survive have also been replaced. 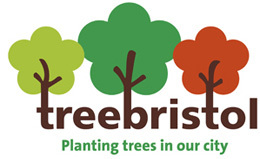 Visit the TreeBristol website for more details of this and other tree planting schemes throughout Bristol. There is also a chance to sponsor a tree. More tree sponsors mean more trees planted. Tree Bristol can be contacted at treebristol@bristol.gov.uk. Work was completed on new play facilities on Troopers Hill Field in 2009. It was very clear from the 2005 survey that the Play Area was the aspect of Troopers Hill Field that most people wanted to see improved. The current play area then consisted of a frame for swings - with no swings - and a slide; by Feb 2009 there was only the slide! There is no fencing to keep out dogs. Many people also suggested that the play area should be relocated. Some wanted it removed altogether. To get things moving the Friends of Troopers Hill organised a meeting on 28th July 2005 (notes of the meeting) followed by a meeting on Troopers Hill Field with Bristol Park's Play Officer to discuss the options. Unfortunately a later meeting to discuss the way forward had a very disappointing turn out. The situation was discussed at the Friends of Troopers Hill AGM in December 2005 and it was decided that as a group we would take no further action at that time although we were still keen to see the play area replaced. 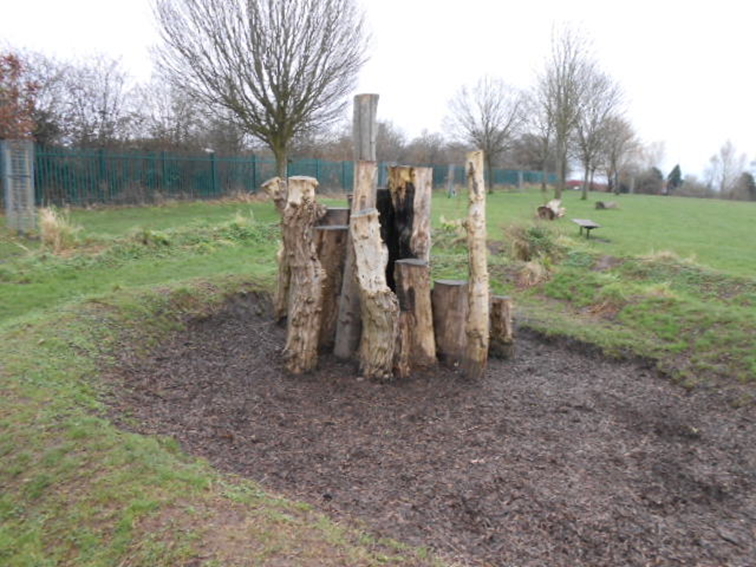 In 2008 Bristol Parks won �2.65m from the government�s Play Pathfinder programme to improve children�s play spaces in Bristol�s parks, particularly for children aged 8 - 13 years. Friends of Troopers Hill were delighted to learn that Troopers Hill Field was to be included in the sites for the second year of the project. 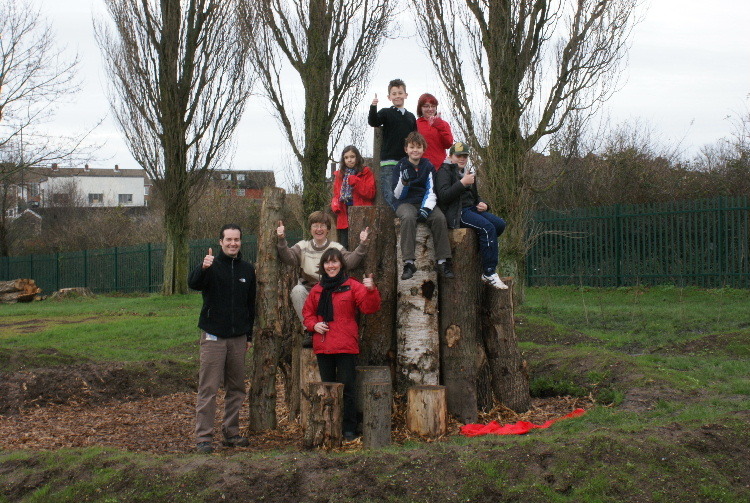 Following consultation through the summer; work to construct the new play area started on 5 October 2009 and was officially opened on 5th December. Unfortunately the log climbing structure is now (October 2016) nearing the end of its useful life as the logs are rotting at their base and the structure will soon have to be removed. The good news is that it lasted until after a much larger play area was completed. Troopers Hill Field or Malvern Road Open Space? Most local people have always considered the area to be part of Troopers Hill and didn't refer to it by any other name, but until recently it was known by Bristol City Council as 'Malvern Road Open Space'. It was this name that was used in the Management Plan. 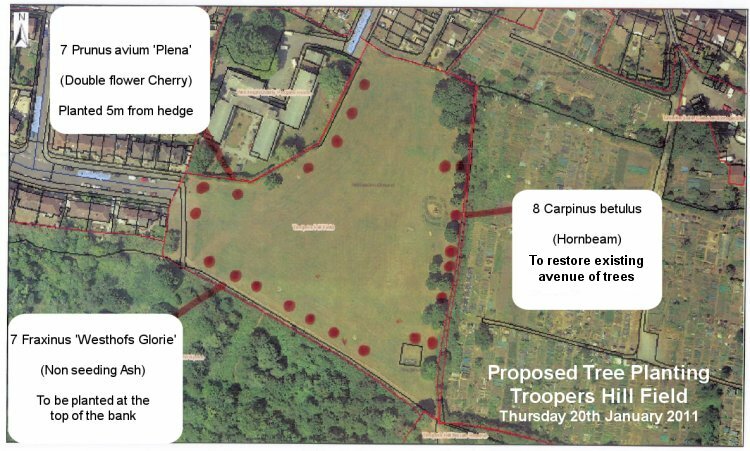 Friends of Troopers Hill carried out a survey in the Spring of 2005 to get people's views on the future of Troopers Hill Field, click here to see the results. In the survey we found that those who did differentiate had several names that they used including 'Troopers Hill Park'; 'Top of the Tump'; 'Troopers Hill Flat' and many more. The most popular names though were 'Troopers Hill Field' or simply 'The Field'. The use of Troopers Hill in the name is also historically correct since the area was part of Troopers Hill Farm; it was purchased by Bristol City Council on 24th March 1932 for use as allotments. It was agreed at our 2005 AGM that we would use the name Troopers Hill Field from then on. Friends of Troopers Hill were therefore particularly pleased in April 2007 to be told that the new sign at the entrance to the Field would be as shown here. Bristol Parks also now use Troopers Hill Field as the official name for the site. Provision of benches was the second most requested improvement in the 2005 survey and two concrete foundations existed from previous benches. Provision of benches is also included in the Action Plan for Year 3. Following discussions at our meetings it was agreed that if benches were to be installed, then we should also try to re-establish a view. As recently as the early 1980s it was possible to see across Bristol from Troopers Hill Field and it was a popular spot to watch the balloons. Since then trees have grown up and you have to walk on to Troopers Hill to get a view. We agreed with Bristol Parks that we could cut down a small number of the trees in Crews Hole Woodland to create a sight line. The trees were cut down in June 2006, having been checked for nesting birds in accordance with the Council's protocol. An area of bramble was cleared at our Work Parties in Dec 06 & Jan 07 to create a new glade in the edge of the woodland. On the day of our September meeting a new bench was installed looking towards this area fixed to existing foundation. A second bench was also installed further down the field, again on an existing foundation. A path through the glade into the Woods was created during 2008, click here for details. This project has been funded by donations received from a local resident and Cromadex, part of Akzo Nobel. See Friends' Funds for details. Bristol Parks paid for the installation of the benches and organised it through their contractors. At the beginning of 2004 there was no restriction on access on to Troopers Hill Field by motorbikes. On occasions they had then been able to get on to the Hill itself. One of the priorities of the Action Plan was therefore to get gates and fences installed to prevent this. The photos below are before and after shots to show the results. The gates are designed to allow pushchairs through and can also be opened by key to allow whelchair access. All the work was funded by Bristol Parks and installed by their contractors.